Available for all new 2020 departures is an onboard drinks package (valued at $199 per person). This includes draught beer, non-alcoholic beer, soft drinks, juices, red/white/rose house wines, and wine recommendations from the menu – served with lunch and dinner onboard your ship. If you would like to add on this package please advise prior to departure from Australia. *Conditions Apply: All prices shown here are per person sole use occupancy of a twin cabin for the category listed here ONLY in AUD, based on best available cruise fare at time of publication (17Apr19). All prices based on cash payment - credit card fees may apply. Cruise deposit, amendment and cancellation conditions apply. The following are NOT included in this package - 1. Ships gratuities 2. Drinks aboard river cruise other than those as listed as included in a Drinks Package (if you choose to pay the additional fee) 3. Any meals other than those as stated 4. Transfer to port to join cruise 5. Transfer from port to depart cruise 6. Travel insurance - proof of which is mandatory prior to documentation release 7. International or domestic airfares. Travel agent service fees may apply. Special conditions apply - please ask for full details at time of enquiry. All passports, vaccinations and visas are the responsibility of the travelling guest to secure prior to departure from Australia. Offer valid until sold out/withdrawn from sale and is subject to availability at time of booking. We reserve the right to correct errors without penalty. Special is valid from 17 Apr 2019 to 20 Aug 2020 or until sold out/withdrawn. 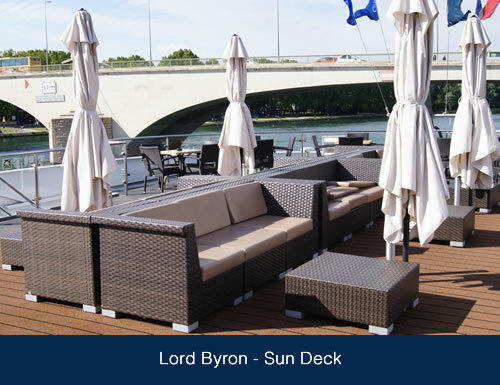 7 Night River Cruise sailing from Avignon to Lyon onboard MS Lord Byron. NOTE: Cruise operates in approximate reverse order to the itinerary outlined below. Please check at time of enquiry/booking. 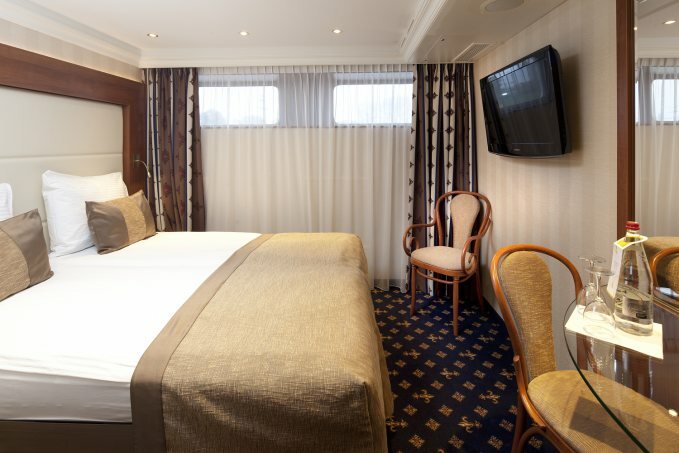 Moored in Lyon’s picturesque historic centre, the dedicated crew will welcome you on board, ensuring you settle into your comfortable and well-equipped cabin and familiarise yourself with the ship – your first-class floating hotel. After our first splendid breakfast, we have a leisurely start enjoying a guided tour of Lyon, one of France’s most interesting cities. The Rhône valley has been the route of choice for invading armies and peaceful traders since ancient times and nestling at the head of the valley at the confluence of two great rivers, the area cried out to be fortified. Founded by the Gauls, Julius Caesar made it his capital and the Emperor Claudius, conqueror of Britain was born here – Lyon was on the map! There are a host of their remains to see but the city came to prominence from the Middle Ages onwards, making a fortune from silk manufacture. Wealth poured in, funding the multitude of renaissance buildings, rich churches and one of Europe’s most splendid town squares, the Place Bellecour, which today adds greatly to the city’s character. Old Lyon is crammed with atmospheric antique shops and intriguing ‘traboules’ – narrow passages passing through actual houses which enabled silk merchants to reach the river more easily and today are just delightful to amble through. Lyon is also generally acknowledged as France’s (and if you ask a local, that inevitably means the world’s), gastronomic capital! In fairness it has much to commend it: nouvelle cuisine was invented near here and you literally trip over the ubiquitous and amazing food shops and restaurants, of which there are more per capita, than anywhere else in the world. As you enjoy your first lunch, the ship quietly slips its moorings, cruising upstream, catching our first glimpses of the vine-clad slopes of the hazy green Beaujolais hills, as we approach one of the world’s most famous wine producing regions. On our left we see the picturesque villages – Morgon, Fleury, Juliénas, Chénas and many more, whilst on the right, you may be lucky enough to catch a glimpse of snowy Mont Blanc – Western Europe’s highest mountain. As the afternoon drifts into evening, the white wines of Mâcon now hold sway as we cruise past the town that gives them its name and what could be better than a cool crisp glass on the sundeck before retiring to the restaurant for this evening’s culinary delights, prepared by the outstanding chef. Rising this morning, we are berthed in Chalon, the home of Niépce, the inventor of photography, and gateway to Burgundy. On this morning’s tour we see the picturesque yet surprisingly tiny villages that read like a top restaurant’s wine list – Meursault, Volnay, Pommard, Gevrey-Chambertin and many more, the source of some of world’s most sublime wines. Nearby is medieval Beaune, Burgundy’s wine capital, which is wonderful to just wander around and in its centre is the instantly recognisable Hotel Dieu with its multi-coloured tiled roof. A stunning building, built as a hospital in the 15th century, a prestigious annual wine auction takes place here, the considerable proceeds of which support the hospital to this day. Of course you cannot visit Burgundy without sampling its amazing wine, so we visit the cellars of one of the most traditional of winemakers for a tour and tasting, before returning to the ship for lunch. One of river cruising’s great pleasures is the fascination of waking in a completely different location! Overnight, the ship has cruised almost imperceptibly south with breakfast in the ancient Roman stronghold of Vienne, established under Julius Caesar. Superbly located in a narrow section of the Rhône Valley where it turns sharply around a steep bluff, Vienne is a treasure trove of historic remains and a walk around will bring its story to life. During another superb lunch, we enter perhaps the most picturesque section of the Rhône Valley as the river squeezes and twists through narrow defiles like Condrieu, St Rambert d’Albon and St Vallier, lined with wooded river cliffs, rising high to both sides. Traditionally these stretches were the most dangerous due to fierce currents and varying water levels and this afternoon is ideally spent on the sun-deck taking in the exceptional views as we navigate a series of locks which never cease to fascinate. Later we moor in the pretty provincial town of Tournon with its tree-lined avenues and across the river, the vine-covered hillsides produce Hermitage, yet another of the world’s most revered wines – a fitting view as we enjoy another exquisite dinner. This morning we cruise effortlessly downstream. Over to the left you catch glimpses of the Alps and as we approach Valence, the landscape gradually becomes less green with more ochres and magentas, whilst the houses have the sloping terracotta roofs resplendent of the Mediterranean and the heady aroma of the sweet air has the unmistakable scent of pine and cypress. You can only be in the midi, or as we call it – the South of France. Catch up on some reading or just laze in the sun whilst the temperature rises. After lunch we explore one of France’s most outstanding natural wonders, the Ardèche gorges, the scale of which is a fitting reminder of Mother Nature’s awesome power. As the road twists and turns, steep cliffs make a thousand feet sheer drop to the torrential river below, eloquently snaking its way through stupendous natural formations cumulating in a natural rock arch carved by the wild waters of history. With caves, grottoes and natural sculptures, there are amazing views at every turn before returning to the gentler sides of the Rhône Valley and the ship in charming Viviers, a medieval town clustered around its Romanesque cathedral. The ship casts off through the famous giant lock at Bollène, as you relax over dinner. This morning you wake under the azure-blue skies of deepest Provence, amidst the rich warm stone of historic Arles. Although small in size, it was the key stronghold on the Roman road to Spain, one of the empire’s richest possessions. Sea-going ships could reach here and the city became the capital of Gaul, Spain and Britain. Our guided tour will help you to appreciate the finer points of Arles’ magnificent Roman remains, including the splendour of the great amphitheatre, the best preserved such building in the world and the source of most of our knowledge of Roman entertainment; the decorum of the theatre built by Augustus; the extraordinary atmosphere of the ancient necropolis – and the Forum, once the city’s heart, where Constantine was installed as Emperor. That disturbed but great genius of an artist Van Gogh lived here for two years during his most prolific period and, inspired by the light and beauty of the Provençal countryside produced 300 works including the Sower, Café de Nuit, the Red Vines and of course, Sunflowers. After lunch we visit the amazing Roman aqueduct, the Pont du Gard, one of the wonders of the ancient world. No amount of fame can diminish the first sight of this 2,000 year old structure which the Romans considered to be the most important testimony to their greatness and indeed it was the highest bridge they ever built. The statistics are staggering: 900 feet long and 160 feet high. Some of the stones are 6 feet thick and no mortar was used in construction. Just to put this in perspective this is a greater span than the river Thames in London. The situation is l ovely too, with pine and cypress covered hills adding to the harmonious setting. Rejoining the ship, we cruise along the Rhône during dinner passing the 13th century castle at Tarascon seemingly standing guard on the river banks. As the morning light catches the red roofs of Avignon’s majestic medieval skyline, it’s a sight to behold over breakfast, after which we embark on a guided tour. Avignon’s destiny changed during the 14th century, with the exile of the Pope’s court here from Rome, bringing with it a century of prosperity. But to truly embrace the feel of historic Avignon you must imagine the rich furnishings, the sumptuous décor, the alleys and corridors teeming with Cardinals, Princes and Ambassadors plus countless pilgrims in the streets below eagerly anticipating benediction. The Pontiff commissioned a host of grandiose building projects and today, the city is immaculately preserved, nestling behind its almost intact 15th century walls and has more remarkable monuments, superbly decorated buildings, churches, chapels and convents than you can possibly count. Most important is the stunning Pope’s Palace whose interior is a masterpiece of medieval architecture sumptuously decorated with outstanding frescoes and tapestries, whilst the private apartments are a must too. After lunch, you are free to explore as you wish, perhaps the Petit Palais, casting a critical eye over the amazing 1,000 renaissance paintings including works by Botticelli and Carpaccio, or taking a stroll on the iconic ‘Pont d’Avignon’ the melody about which makes us all recall our first French lessons. It’s our final afternoon so you may wish to do some shopping, or just find a quiet shady street café in a timeless Provençal square and reflect on the delights of the past few days. Perhaps though, return to the sumptuous surroundings of your ship – go on the sun deck and just contemplate the wondrous places you have seen and experienced over a quiet cup of tea! This evening the Captain’s dinner takes place, serving specialities of the regions you have visited during your voyage of discovery through this fascinating country. After breakfast this morning you must reluctantly leave the ship and her dedicated crew. 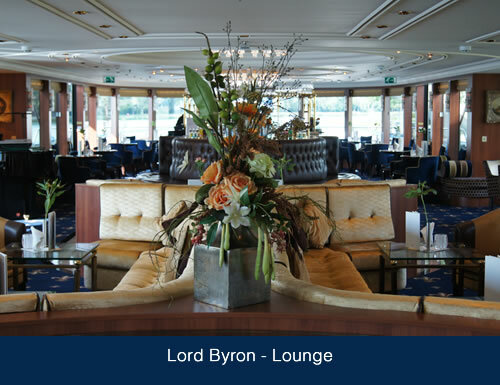 How can one adequately sum up the wonderfully elegant five-star MS Lord Byron? How can we describe this extraordinary vessel that’s truly one of the finest ships of its type afloat anywhere in the world? 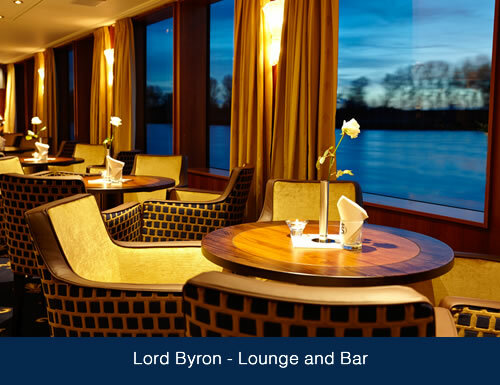 Quite simply, every single aspect and element is designed to the highest possible specification and our own exacting standards to bring you the very best and most enjoyable river cruising experience, in the most luxurious comfort. We have worked tirelessly with our Swiss partner Scylla AG, one of the world’s most experienced luxury rivership builders with a pedigree stretching back over nearly 40 years, to design the perfect vessel, with virtually no expense spared. You’ll feel the unmistakable understated opulence of this extraordinary vessel as you board through the spacious, marble-floored lobby. Stylish furnishings using environmentally friendly materials are beautifully combined with the most advanced safety systems… and the work of a wonderful designer’s eye conjuring up the classic lines and sophistication of a luxurious ocean liner. As always, the finesse is in the detail – beautifully crafted tropical hardwoods, wrought iron, highly polished copper and brass, all beautifully illuminated then added to soft leather furnishings and imaginative colour schemes, promotes a subtle, chic ambience of exceptional taste. 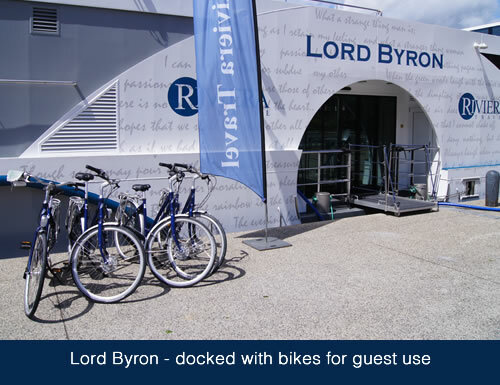 Intuitive, unobtrusive service is graceful, efficient yet friendly as you might expect from a Swiss operated ship with 35 staff serving just 140 guests. This outstanding ratio of 4:1 allows a personal touch which makes such a difference to your cruise. Plus unlike other vessels typically carrying up to 200 passengers, you’ll enjoy simply far more space – as well as a smaller, more intimate dining experience. 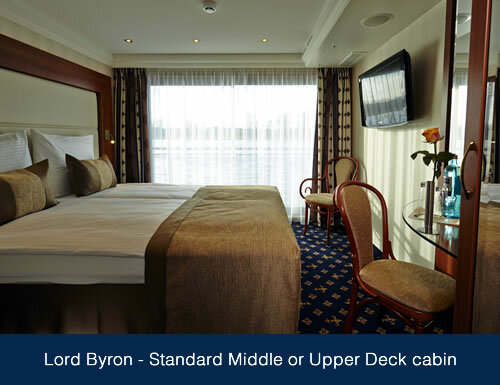 In addition to the spacious Sun Deck, there are three superb air-conditioned decks on the Lord Byron – the Diamond (top), Ruby (middle) and Emerald (lower). A stylish glass lift and a wide, elegant wrought-iron railed staircase connect the Diamond and Ruby decks, whilst the Sun and Emerald Decks are accessed by staircase. On the Diamond Deck is the magnificent panoramic observation lounge, the heart of the ship with wonderful views through floor to ceiling windows of the ever-changing landscape as you move along the river. This is where the ships superb design really is so evident. 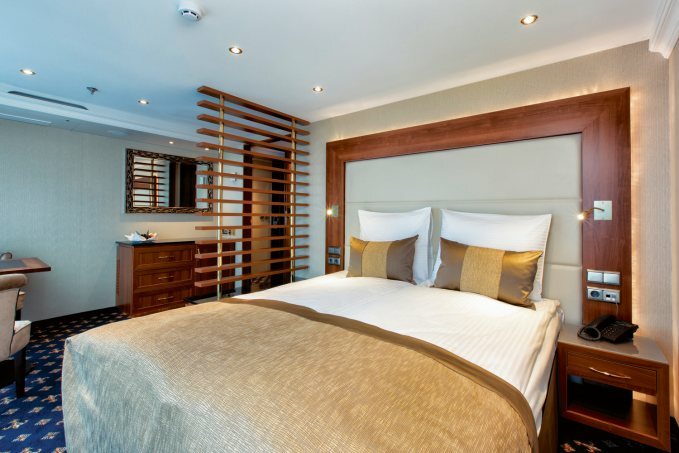 You’ll love the quality feel, the genteel ambience, the rich carpeting, the marble-tiled bar and the choice of sumptuous leather armchairs and soft modern settees. What could be better than to lose yourself in conversation with like-minded new friends, sip a coffee, perhaps play chess or bridge, or just relax whilst admiring the incredible scenery?And after a delicious dinner, appreciate our pianist, a gentle dance on the purpose-designed dance floor, or just enjoy a quiet read in the peaceful Lido Bar at the rear of the ship, ideal to while away an hour on a comfortable terrace absorbing the sights and sounds of Europe’s great rivers. 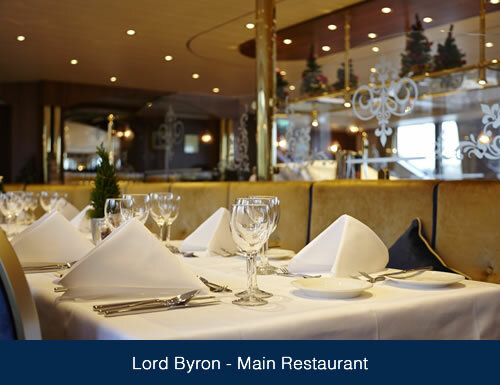 On the Ruby Deck is the main restaurant – with cuisine of the absolute highest order, attentive service with just four or six people at most tables, and yet again the elegant surroundings of glass, marble, deep wool carpets and crafted hard-wood panelling evident throughout the ship. The Sun Deck – and especially the forward viewing area – is perfect for watching the historic riverside villages, steep vine-clad valley sides and other scenic wonders glide serenely by. It’s well equipped with plenty of comfortable outdoor chairs and sunloungers, deck games including shuffleboard and giant chess, a small splash pool where you can cool off, and a full bar service. Sometimes we hold barbecues here too, weather dependent of course – a great way to meet new people over a glass of wine. 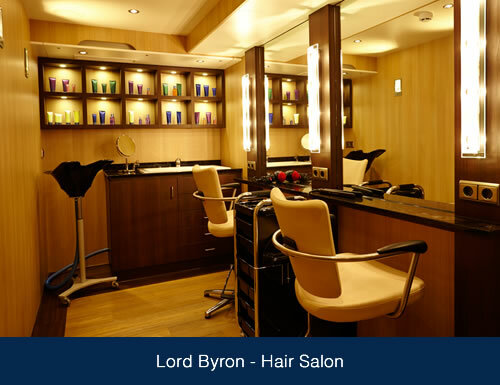 Another very special feature of the Lord Byron is its purpose-designed and extensive spa. You can reserve the spa for your private use to take a sauna or use the steam room, or perhaps visit the onboard hairdresser (small additional fee). What’s the best way to travel through the heart of Europe and discover its greatest delights? 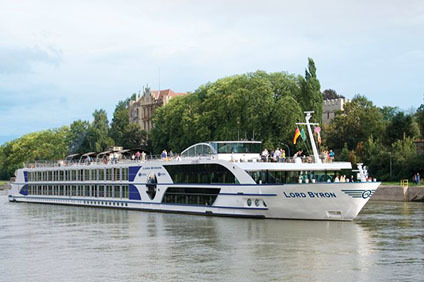 You’ll find it hard to beat a European river cruise along some of our continent’s most timeless, appealing waterways. After all, people have travelled Europe’s mighty rivers for centuries to trade, explore and sometimes conquer. Steeped in history and culture and flowing through stunning scenery, they form natural highways that connect great cities and beautiful towns, each with its own unique and rewarding character. While you sit back and relax on your river cruise of Europe, the views change constantly as amazing destinations come to you. The pace is slower, with plenty of time to soak up the atmosphere and contemplate the world as it passes serenely by. If you’re feeling energetic, there are new opportunities every day to explore riverside ports with knowledgeable guides or at your own speed. If not – you can just take it easy. Your European river cruise might take you down the majestic Rhine or Danube, to atmospheric cities like Coblenz and Vienna. You’ll pass astonishing ‘fairytale’ castles and learn their mystical stories. There’s the meandering Moselle with its impossibly steep riverside vineyards, the lesser known River Main twisting through Germany’s rural heart. In France, the Rhone flows majestically almost from the Burgundy vineyards to the heart of sun-kissed Provence, while the iconic Seine will transport you from Paris through the countryside of impressionist painters to medieval Rouen and historic Bayeux. Then there’s the picturesque and largely undiscovered Douro with its dramatic cliffs, lush hillsides, medieval walled villages and terraced vineyards. You experience all this in the most relaxing manner possible on your river cruise through Europe, on board some of the most spacious ships gracing Europe’s waterways. No sea-sickness or rough water – just comfort and luxury with superb service and dining on an unforgettable journey through time and culture. 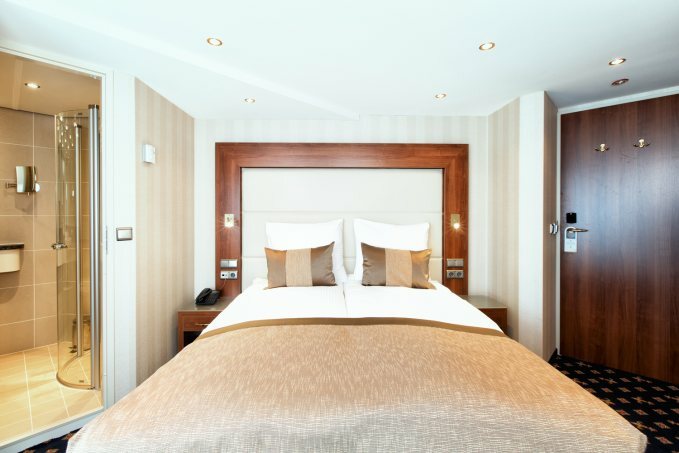 At 15 square metres (161 square feet), your luxuriously appointed cabin is amongst the largest, most comfortable and best appointed on any European river cruise vessel – with all the high quality facilities you would expect from a top hotel, and more. 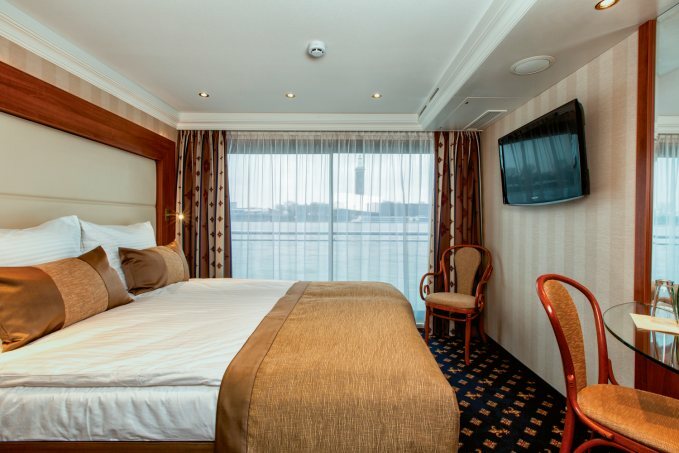 For more space you can upgrade to a suite available on all decks, featuring the same facilities as standard cabins but being larger at 18.5 square meters (199 square feet). The extra space is purely devoted to the living area, so you really notice the difference. These are the same size and have the same features as the suites. 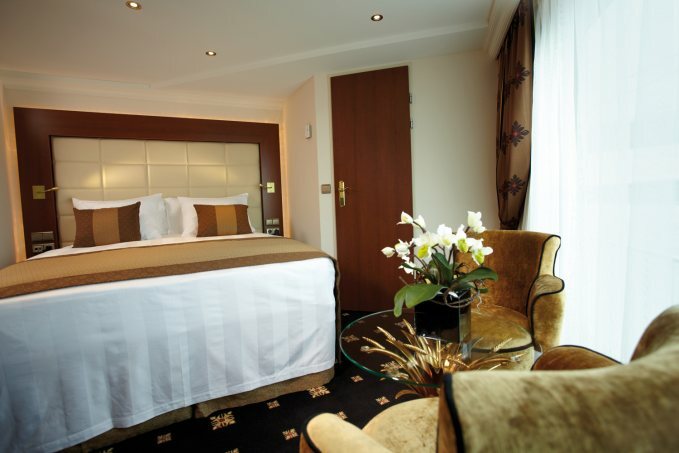 Suite- featuring the same facilities as standard cabins but being larger at 18.5 square meters (199 square feet). The extra space is purely devoted to the living area, so you really notice the difference. For the ultimate in space and river cruise luxury, on the Diamond (top) deck there are four deluxe suites, at 22.5 square metres (242 square feet) a full 50% larger than a standard cabin, beautifully appointed and incredibly comfortable, plus for a final homely touch, soft cotton bathrobes and slippers. You will love them.